For the past two seasons with the Cubs, David Ross was Jon Lesters' personal catcher, but this season he hasn’t been there. Sunday night he will be at Wrigley Field to help call the game against the Cardinals as part of the ESPN broadcast crew. After fifteen seasons and multiple concussions, Ross put family first and walked away from the game he loved. We’re sad about that. Cubby Nation is going to miss him. He had become a fan favorite on the Cubs. Before the start of spring training last year, Ross announced he would be retiring at the end of the season. The boys decided to have some fun with him and celebrate his last year in baseball by throwing him a party. A party that started in February and lasted all the way to November. They gave him a nickname. 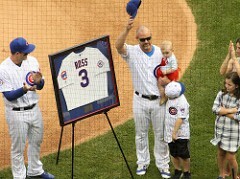 For his final season he would no longer be known as David Ross. He would now be referred to as Grandpa Rossy. It was fitting. 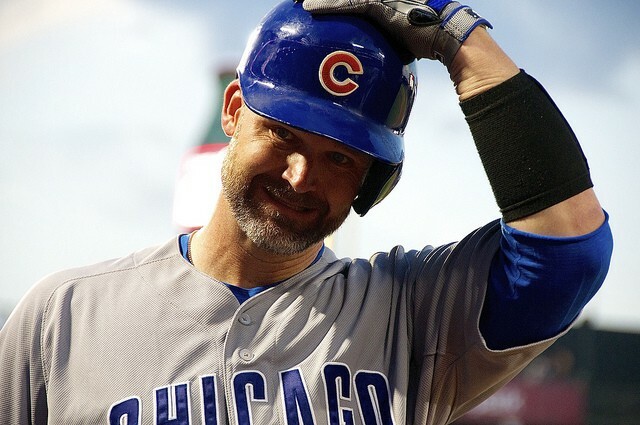 Grandpa Rossy was the emotional leader and the calming influence for a team that had its fair share of young talent. A core of young guys who had a taste of the postseason in 2015. But 2016 was different. They went into the season the odds on favorite to win the World Series. Grandpa Rossy quickly became the emotional leader of a team that had four players with world series rings. His sense of humor and his veteran influence kept the team in balance. And as the season progressed he became a favorite of the Wrigley faithful and of me. 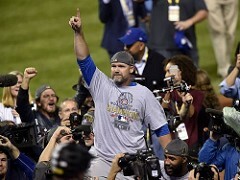 The way he fiercely protected his buddy Jon Lester and the pitching staff by picking runners off was cool. Grandpa was a team first guy and that is how a lifetime .229 hitter carves out a fifteen year career with eight different teams. On May 27th he hit his 100th career home run. In his final regular season home game at Wrigley the Cubs surprised him with a tribute. That doesn’t usually happen for a backup catcher. 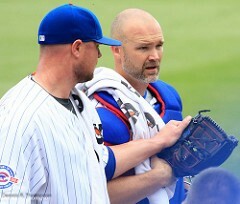 But Grandpa Rossy was not your ordinary back up catcher. There were multiple standing ovations. And of course Grandpa homered. Why wouldn’t he? After all, it was a fairy tale season. And then to top it all off Joe Maddon walked out to the mound in the seventh inning so he could give Grandpa his final curtain call. “I couldn’t write it any better,” Ross said, undoubtedly between tears. When the dream season ended and the Cubs had finally ended the 108 year drought everyone knew the party was going to be historical. And for one last time in 2016 this amazing team would gather and celebrate their accomplishments. It would be one last chance to say thank you to the fans. It would be one last chance to say goodbye to Grandpa. We could come up with some fancy, flowery way to say goodbye to the family first, team first, journeyman, emotional, back up catcher who wore number three and who everybody called Grandpa. Rossy and the boys can do it better. Doug Preszler is the type of person who can be a Cubs fan and an Iowa fan while living in South Dakota. He is a man who cares not for regional loyalty. He can be found on Twitter @PreszlerDoug, telling tales of the Dakotan Cubs fan’s existence.